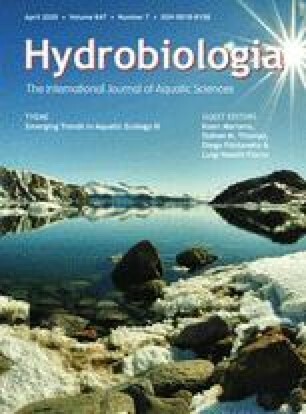 The distribution, behavior and metabolism of the mesopelagic jellyfish, Periphylla periphylla (Péron & Lesueur), were investigated in Lurefjorden, Norway. Field studies, conducted in 1998–1999 with plankton nets and a remotely operated vehicle, indicated that 80-90% of the dense (up to 2.5 m−3) population migrated 200–400 m vertically each day throughout the year. In situ observations with red light revealed that swimming rates and feeding activity varied with age and time of day. Detection of turbulence and contact with surfaces caused this medusa to conceal one or all of its tentacles in the stomach or to shed nematocyst-laden tissue from the tentacles. Stomachs of medusae collected with nets were often full of prey entangled with the sloughed tissue. Stomachs of medusae captured individually with ROV samplers were empty or contained only a few prey in their stomachs (typically, 1–4 copepods Calanus spp. or chaetognaths Eukrohnia hamata Möbius per medusa). Low rates (0.4–5.6 μl O2 mg C−1 h−1) of oxygen consumption of P. periphylla suggested that this species was sustained by relatively few (1–34) prey d−1. 1.Harbor Branch Oceanographic InstitutionFort PierceU.S.A.